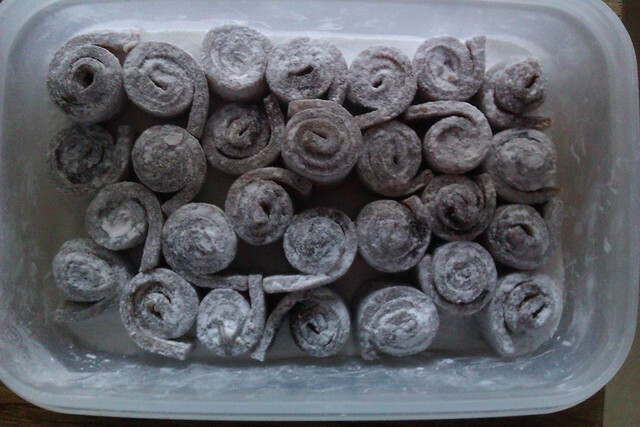 These are rolls of plum leather, inspired by a recipe from the BBC Sweets Made Simple series. They look very different to their Plum Leather Belts but are in the same family. Rather than using fresh plums, I used some precooked puree that we made and froze two or three weeks ago, adding sugar (caster and golden syrup) and lemon juice (the acidity probably helps preserve it and it enhances the flavour) to taste rather than weighing precisely. The mixture is poured onto a (microwave safe) clingfilm lined baking tray and placed in a very low oven for a very long time. I turned the dial on our top oven until it just started to engage and left the leather slowly dehydrating for about 24 hours with further time in the oven to cool off before extracting it. The resulting sheet is then cut into strips and rolled. My leather was still a bit sticky so I also coated with what is known as confectioners sugar: icing sugar mixed with cornflour, so still very sweet but with better anti-caking properties. I would like to try with a thinner sheet and see how the results compare but I’ll eat my way through this lot first.